They were proud parents, a pair of loons, a silhouette in the blue sky, heads breaching the surface, the black and white pattern draped over their backs like a geometric blanket. And, every spring, these loons would glide by the point where I live, so close as to be swallowed by the shade from our majestic oak tree . Two fuzzy babies rode on their parents’ backs, protected from turtles preying on the young. How many years have passed since these loons, loyal to this Adirondack lake, first nested on the roof of muskrat lodges in the marsh? How many years? I knew loons, usually monogamous for a lifetime, could live 30 years and, for a decade, I welcomed spring with these sojourners above and beneath the water, their voices the echo of the wilderness. 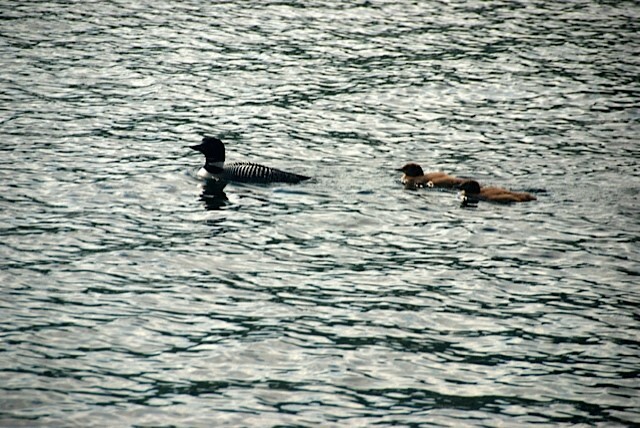 When the loons appeared I was home, awaking to a new season where gentle waters lapped the shoreline. Then one year, when the hydrangea buds burst with the promise of a glorious summer, I heard the sound of the loon—but only a single loon, lacking a mate. There would not be babies huddled on a parent’s back, enjoying the ride into the future. Not this year. What had happened? According to the local forest ranger he had found a dead loon lying by the shore in a bed of twigs. Attacked by a predator? Poisoned by mercury or lead fishing sinkers? Succumbing to old age? Who would know? A loon makes many sounds: the laughing tremolo, a yodel made by a male loon to announce its territory, the sound a family makes when searching for fish. None of these sounds explained what happened to the loon’s expired spouse. So you have a home on Brant Lake? Lucky you!